These two rivals are on opposite spectrums right now, while the Oakland Raiders are on 2 game winning streak, the San Diego Chargers are trying to break a 2 game losing streak. For obvious reasons the Raiders are 4.5 point favorites in this match, not only are they playing at home they are facing a team who lost the lead in last week’s game against the Saints in the 4th quarter, and now only did they give up their lead, they allowed Drew Brees to score not one but two touchdowns in the last 5minutes of the game. The Chargers are coming into this game with no momentum, unlike the Raiders who seem to have gathered their ducks and put them into a nice straight line, after defeating the Baltimore Ravens at home last week making that their third road win of the season. 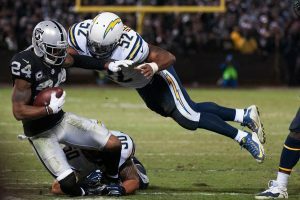 Now they will play hosts to their divisional rivals the San Diego Chargers; the Raiders need to win to appease their rowdy fans in the Oakland Coliseum. It is all fine and dandy to win on the road, after all it adds credibility to the teams potential but the fans want to see their team succeed at home, and so far, their only home game against the Atlanta Falcons turned out to be a 35-28 loss. This game will be the first divisional match up for Oakland, last year the Raiders swept the Chargers in the series winning 37-29 in week 7 and again in week 16 23-20 in overtime. The picture gets even bleaker for the Chargers who seem to be hopeless against AFC West divisional rivals, they are 0-9 in their last nine divisional games. In the last 3 games Oakland has showcased their special teams, defense and offense. The Raiders have one of the best offensive lines in the league and Derek Carr has shown what he can do when given enough time in the pocket. If the Chargers hope to have a prayer in this game their pass rush has to step up and be excellent, otherwise the Oakland offense will plow through them. The silver lining for San Diego is that the Raiders offense is somewhat banged up and there have been a lot of changes in the lineup to compensate, so their defense could have a shot. On the other hand, San Diego needs to protect Rivers more, he is one of the few things holding this team together, if they lose Rivers because of inadequate coverage, the team might as well go home for the rest of the football betting season. San Diego has lost its last two games by a small margin, that will probably not be the case in this game, I don’t feel the Chargers pass rush will be enough to stop Carr and the Raiders will score big in this game more than covering the spread of 4.5 points. Rivers will do a good job and he will not allow his team to be shut-out but the Chargers inability to close will eat them up once again. I predict the final score of the game will be 30-21. If you are looking for the best lines in the NFL don’t forget to check out AceSportsbook.com.